Swollen hands are a common problem during physical activity, such as hiking. Although the cause of swollen hands isn't entirely clear, it seems to be your blood vessels' response to your body's increased energy demands. Swelling, though generally harmless, often indicates your body's attempt to restore balance and body temperature. Consult your physician if swelling does not go down one or two hours after hiking. When hiking, your body increases blood flow to your lungs, heart and muscles, which decreases blood flow in other areas, such as your hands. This decrease causes your hands to cool down and swell. Increased body temperature due to exercise dilates the blood vessels in your hands and pushes them closer to the skin's surface, which may cause swelling as well. Blood vessel dilation, also known as vasodilation, may be one way your body regulates temperature during physical exertion. Swollen hands may indicate a serious condition known as hyponatremia, which occurs if you consume too much water while hiking. Increased water intake interrupts the sodium balance in your blood. Excessive sweating on top of diluted sodium in your blood may remove too much sodium from your body. This leads to swollen hands, fatigue and nausea. If you suspect you are suffering from hyponatremia, end your hike and consult your doctor immediately. If left untreated, the condition may be life-threatening. Other factors may play a role in swollen hands during a hike. Females may notice swelling during their menstrual cycle due to water retention. Tight rings, bracelets or watches may make swelling more noticeable and uncomfortable. Pregnant women may be more susceptible to swelling due to increased blood flow to the uterus in addition to the heart, lungs and muscles. Certain outdoor allergens may also cause hand swelling and indicate an allergic reaction. Although the specific cause of swelling hands during hiking is unknown, there are a few steps you can take to prevent or reduce the problem. 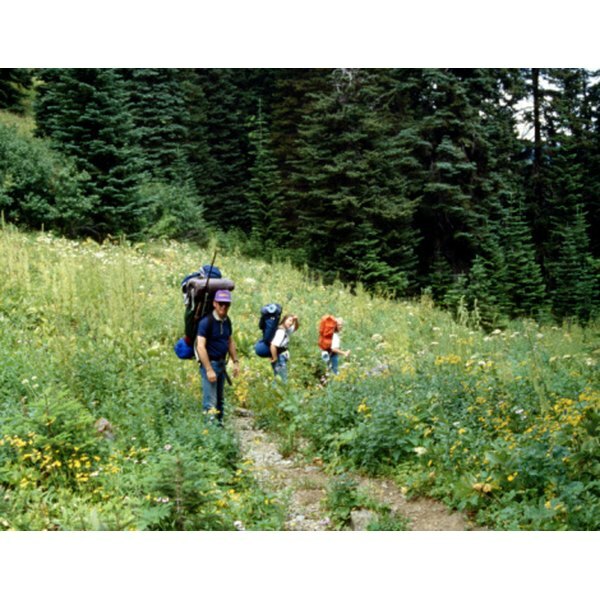 Hike in cooler temperatures to avoid overheating and swelling. Avoid eating salty snacks prior to your hike to avoid water retention, and pay attention to the amount of water you drink during your hike to avoid diluting your sodium levels. If you start to notice swelling during your hike, raise your hands over your head every so often. A gentle hand massage may help reduce swelling by moving the blood out of your hands.